In the national hunt racing at Stratford today Braavos makes The Shortlist with a perfect score of 15, having five sections of green. He looks really well suited by conditions here today and has things in his favour for a big run. 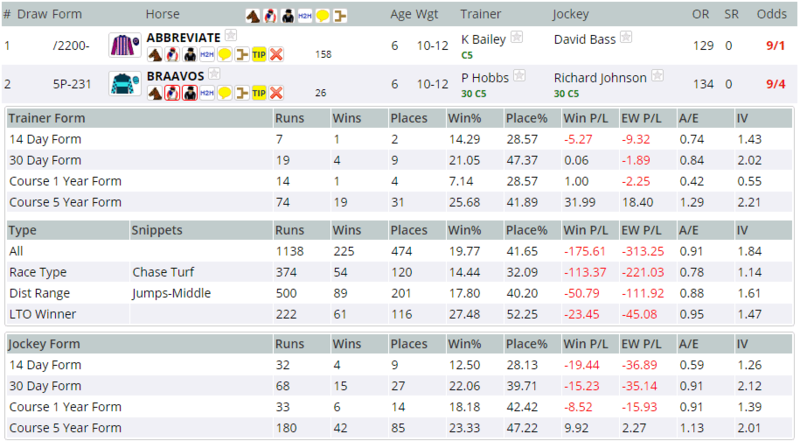 The current form of Braavos is useful with a win last time out and a second and third in his last three races. He looks comfortable distance wise between two and a half miles and three miles and also goes well enough in the softer conditions. When looking at the trainer and jockey form we can see that both Phillip Hobbs and Richard Johnson have excellent long-term form here at Stratford. Over the past five years, they are both showing an Impact Value of over 2, meaning they are both twice as likely as average to have the winner here. When looking at the Instant Expert report we can see how well suited Braavos is to conditions and also how the rest of the field doesn't appear to be. The next best is two sections of green which is nothing to get carried away with. Early leaders here over this distance have a good record with 18.68% of them going on to win the race, for a level stakes profit of 4.78. Some Are Lucky looks most likely to be taking them along with Braavos usually content to sit in mid-division and bide his time. It will be interesting to see that given the relative lack of pace in the race whether Richard Johnson takes Braavos much closer to the pace in this small field or even leads himself. Click here for the 16:00 at Stratford.